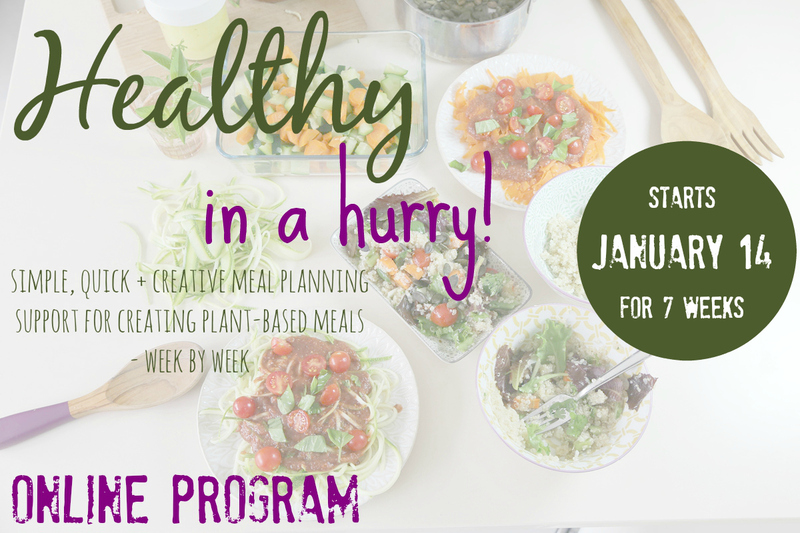 This 7-week online program provides simple and creative meal planning support to help you make healthy eating a part of every day life - without spending hours in the kitchen. Click on the box below to find out more and sign-up directly via a unique online platform that combines videos + PDF + worksheets to help make healthy meal planning a reality! The Mindful Eating Experiment is a step-by-step 8 week online course which focuses on making 1 simple change every week to how you eat. Mindful eating has been shown to reduce overeating, increase meal satisfaction, reduce cravings and can add more mindfulness to your day. This program allows you to experiment with a total of 8 simple techniques which you can use wherever you are and whatever you are eating. Starts March 16, 2016 - includes video, audio + PDFs that you can access anytime, even after the course is finished. Only $49 - find out more + sign-up here. Do you have a hard time dealing with ‘negative’ emotions? Do you find yourself either numbing with food or alcohol or TV or exploding and regretting your reaction later? What if we could start seeing emotions as neither our boss nor our enemy but as messengers, each with something specific to tell us? This introduction to emotions will allow you relate to your emotions in a completely different way. It will provide you with the language to understand what is really going on when an emotion shows up and how to work with it, rather than against it. Through simple, experiential tools, you will learn to handle emotions in a way that is counterintuitive to anything we are taught. I only learned about the role each emotion plays and how to relate to them in a healthy way recently and it has completely changed my relationship to myself and to others - which is why I am excited to share this! People struggling with emotional eating. Anyone who would just like to learn more about emotions or how to live with them. 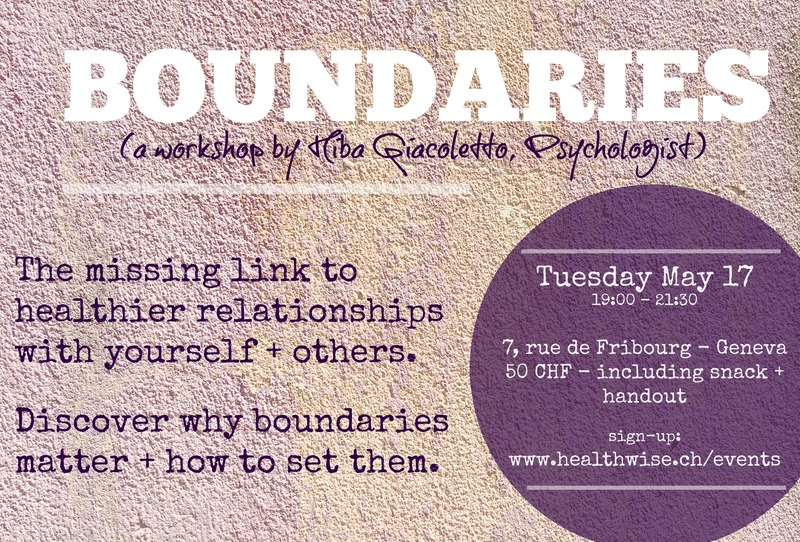 WHEN + WHERE: Thursday April 14, 19:00 - 21:00 @ 7, rue de Fribourg, 1201 Geneva. The Understanding Humans Lunch is a talk on a Psychology topic shared in a simple and relevant way over lunch. 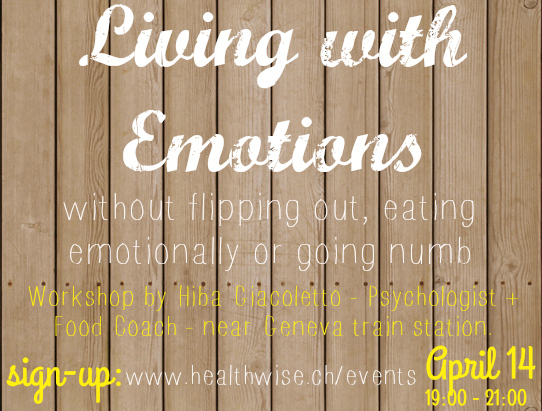 Lunch on May 31 will be an introduction to emotions. Imagine your internal world - your emotions, thoughts, desires, needs - is a village. Every emotion plays a role in this village - it shows up for a reason. For example, healthy anger is the gatekeeper of your village boundary, it decides who to let in or not. So when anger as an emotion shows up, it means that someone has crossed our boundary and we need to repair this boundary. As the leader of our village, we don't need to act on what each emotion is telling us to do but we do need to listen to the message an emotion is telling us - or feel the emotion. Otherwise, we end up suppressing our emotions and then exploding, instead of dealing with them in a way that works for us (read more here). You will learn why emotions exist, why they matter and a very different approach to living with them, even when they are painful. I will use the metaphor of a village of emotions as a fun and simple way to understand how emotions work. This talk is based on research from Acceptance and Commitment Therapy (ACT), a mindfulness-based behavioural approach, and the work of Karla McLaren. Space is limited, please sign-up using the form below. Do you have a hard time saying no to things you don’t want to do? Do you feel that people are always taking advantage of you? Do you find yourself always needing to please people? Do you have a hard time knowing what you want, making decisions or being clear on your desires? If you answered yes to any of these questions, you need boundaries! Well, imagine that your internal world - your emotions, thoughts, desires, needs - is a village. In order for your village to thrive and create the life you want for it, it needs to feel safe and protected. And it can only do that when it has a clear protection around it, one that defines what’s OK and not OK to enter your village. And villages don’t like being invaded. So often we end up resentful towards ourselves and others because we can’t say no or clearly state our needs. This workshop is based mostly on Acceptance on Commitment Therapy (ACT), a mindfulness-based behavioral approach, and the work of Brené Brown, Harriet Lerner and Karla McLaren. 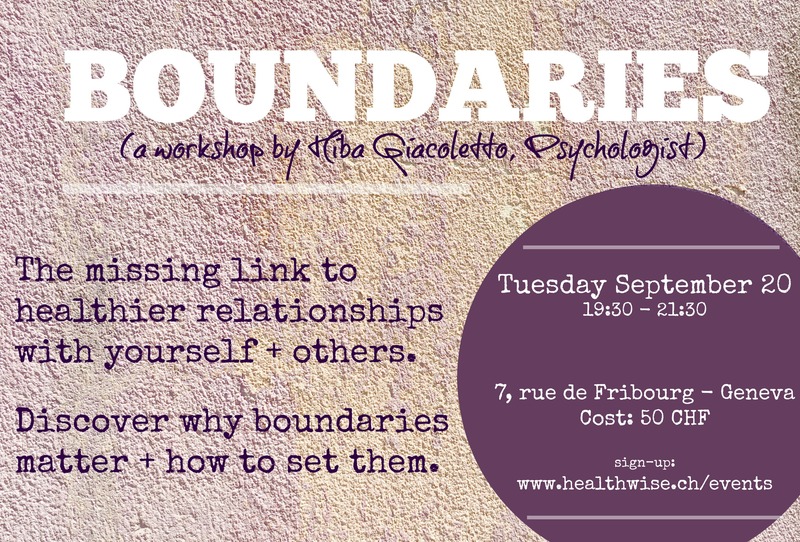 You will leave this workshop with a clear idea of how to start setting boundaries in your own life so you can have healthier relationships with yourself and others. Cost: 50 CHF, including handout + snacks. 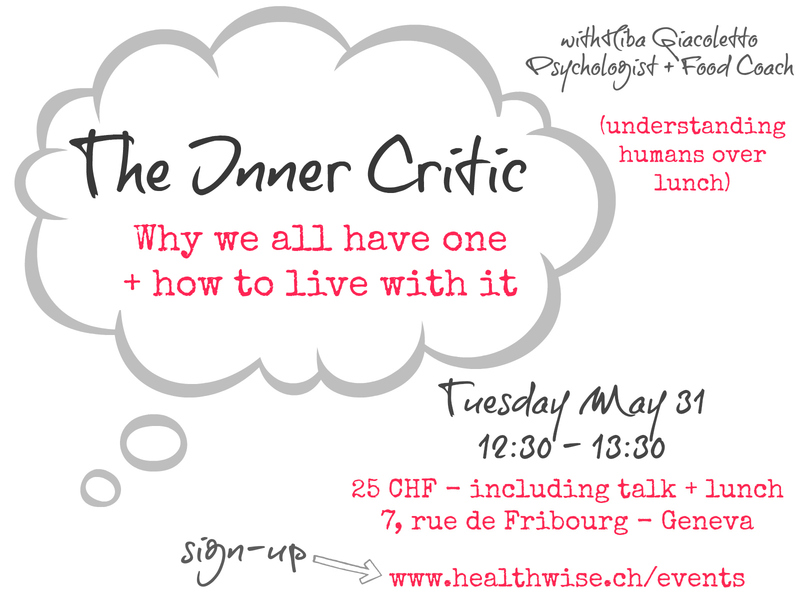 Lunch on May 31 will be about the Inner Critic. Why are we our own worst enemy? How did being so critical with ourselves help us survive from an evolutionary perspective? How does being hard on ourselves 'protect' us today? And most importantly, how can we live with the Inner Critic? This talk is based on research from Acceptance and Commitment Therapy (ACT), a mindfulness-based behavioural approach. ♥ Doubt yourself often + are afraid of making mistakes? ♥ Avoid situations where you might not succeed? ♥ Have a hard time making decisions? ♥ Obsess about needing to look, eat or act 'perfectly'? If yes, then you might be dealing with perfectionism. 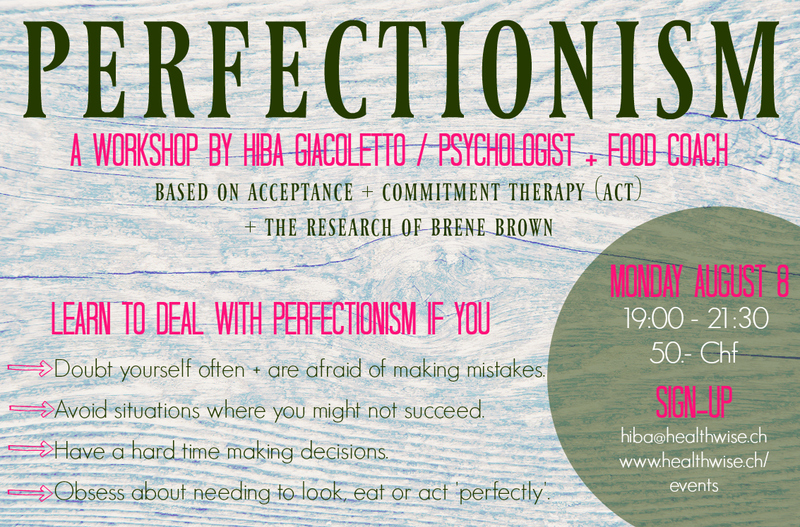 The causes of perfectionism + the specific role it is playing for you. When + how trying to be 'perfect' gets in the way of living for you. A better way of living without giving up on achieving or excellence. Imagine your internal world is a village. Every emotion has a role to play in this internal village - there are no good or bad emotions. When we feel something, there is always a good reason for it, a message that is being conveyed by this emotion. We can learn to use emotions as signposts to better navigate life, particularly when making decisions. Yet when we don’t know how to understand or work with them, emotions can feel overwhelming and we might try numbing or suppressing them. Numbing or suppressing emotions means we are not fully able to experience joy or aliveness. And it can sometimes mean feeling out of control and exploding without meaning to. 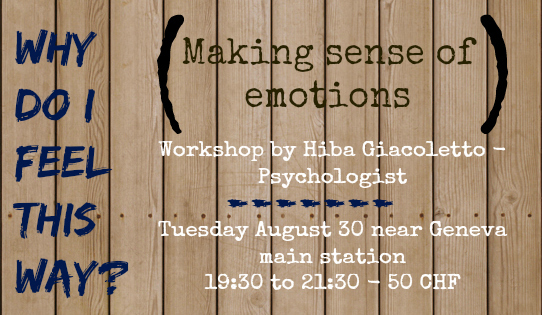 In this workshop, you will learn why emotions exist, why they matter and a very different approach to working with them, even when they are painful. I will use the metaphor of a village of emotions as a fun and simple way to convey how emotions work. Join us for a magical afternoon marking the end of summer and the beginning of autumn - an opportunity to release what we no longer need to make space for the new. Yoga (all-levels) by Marisa followed by a talk on letting go and how this works from an emotional perspective by Hiba. We will then share a simple ritual around releasing what we no longer need, saying goodbye to the summer and welcoming in autumn around healthy snacks and warm tea. No prior yoga experience necessary- everyone is welcome! Join us for some cozy vibes as we connect with ourselves and each other in the last outdoor yoga session of the season. Please sign-up below to confirm participation so we can plan for snacks and drinks! 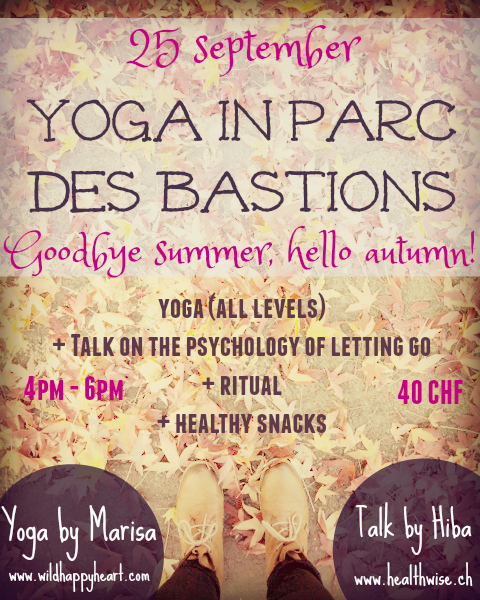 Cost: 40 CHF including yoga, talk, ritual + healthy snacks and warm drinks. 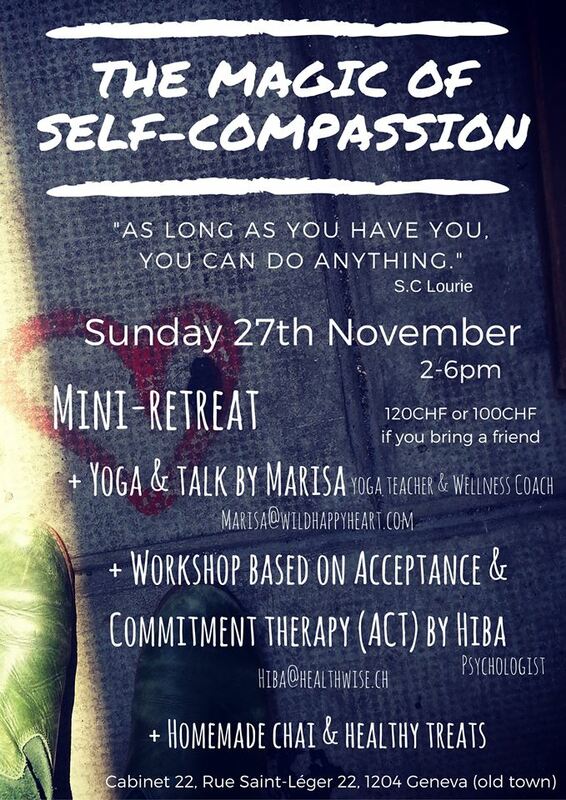 A mini-retreat on a Sunday morning combining yoga + psychology + healthy food in Geneva’s beautiful old town. 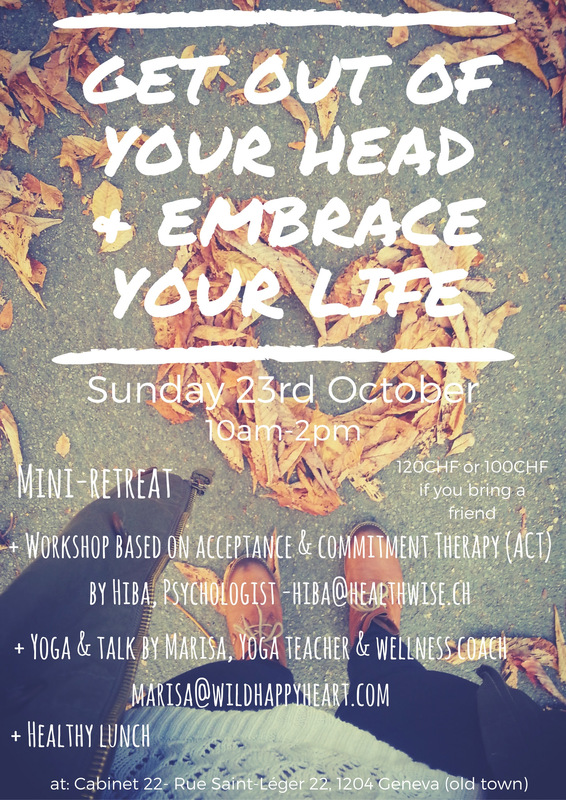 Get out of your head and embrace your life through a mix of Acceptance and Commitment Therapy (ACT) - a mindfulness-based behavioral approach - wild-hearted yoga + connection with kindred souls over a healthy lunch. ♥ Why can’t I seem to switch off my mind’s negative chatter despite my best efforts ? ♥ Why do I sometimes feel like my own worst enemy ? ♥ Why can’t I just seem to be able to enjoy my life instead of doubting, analyzing or worrying all the time? ♥ How can I get more out of life instead of feeling like life is just passing me by? We will learn how to relate differently to all the doubts, insecurities and worries that never seem to stop in our heads - yet often stop us from living a life of freedom, purpose and aliveness. Through yoga, we will focus on getting into our bodies - because it is only when we are fully embodied that we are not just living in our heads - but truly living, truly alive, to what is happening here and now. We will share a healthy meal while focusing on body-centered eating - experiencing our food in a completely different way. Finally, we will define and connect to our values - our heart’s deepest desire for how we want to live - so we can start building lives we actually want to fully embrace. …have innovative tools to relate to the doubts, worries, self-criticism we tend to take so seriously differently (beyond meditating or mindfulness). …no longer allow your mind’s negative chatter to dictate what you do with your life, but start consciously choosing what truly matters instead. …have simple practices to live more fully in your body - the only part of you that is always in the here and now. …So you can actually start living a more vibrant, fulfilling life where you embrace what truly matters to you and live with freedom, purpose and aliveness. + Short guided meditation to start getting into your body. + One hour of wild-hearted yoga with Marisa - Yoga Teacher + Wellness Coach. + A healthy & delicious home-cooked meal eaten mindfully together. + Exercises around identifying + connecting to your values to fully embrace life. Think cosy vibes, nourishing body, mind & soul. 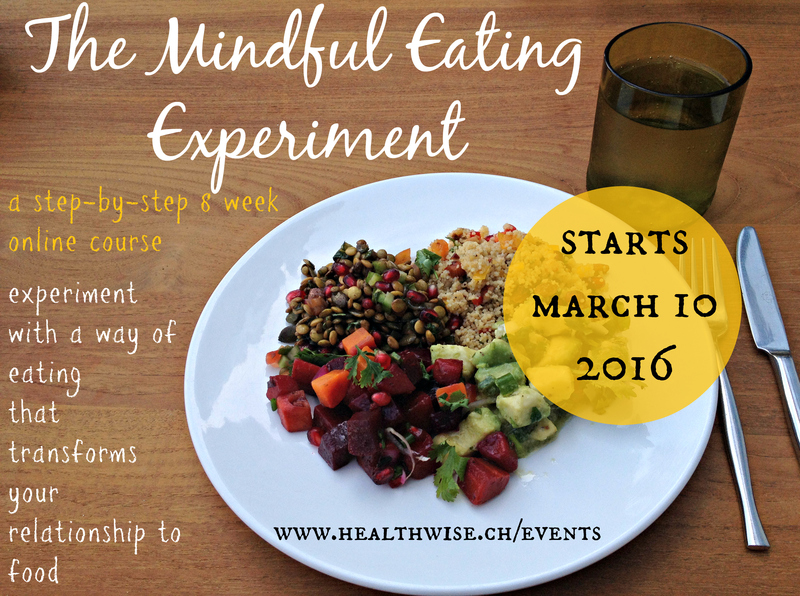 Cost: 120 CHF or 100 CHF each if you bring a friend - including workshop, yoga, lunch and handout. Are you struggling with something in your life right now? A separation / break-up, death of a loved one, depression, life as an expat? Often we end up feeling helpless because difficult situations like this often don’t have a ‘solution’. There isn’t much we can do to make the situation easier and the dark times can feel like a burden we have to carry. ♥ Drop the struggle with painful thoughts. ♥ Learn to deal with difficult emotions. ♥ Start to have your own back in times of difficulty (self-compassion). ♥ Connect to what matters to you in this situation - your values: We hurt because we care. ♥ Differentiate between mindful distractions vs avoidance. ♥ Better listen to your needs during this time. 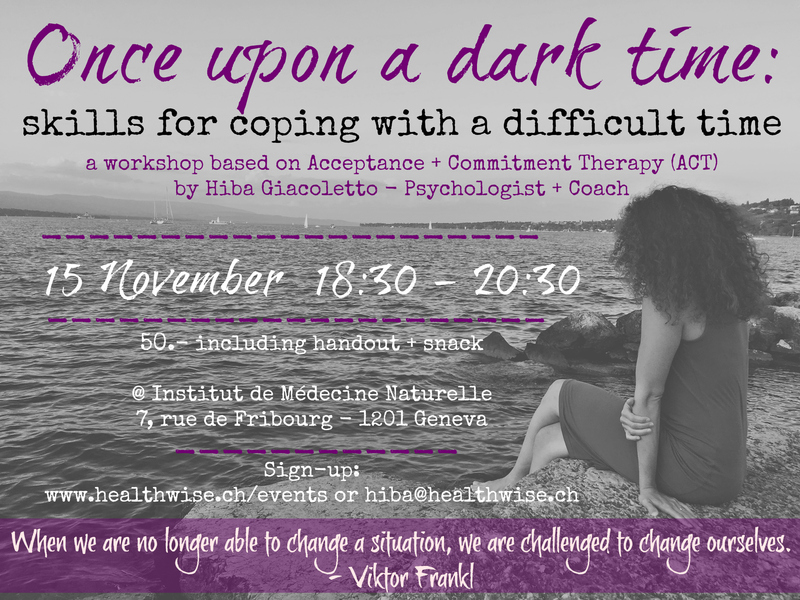 This workshop is based on Acceptance and Commitment Therapy (ACT) and given by Hiba Giacoletto - Psychologist + Coach. Join us for some cozy vibes in Geneva's old town! Self-compassion is the magic ingredient to pretty much anything in life: From better dealing with difficulty to making healthy change. Self-compassion is about learning to have your own back. It is the quiet confidence that comes with knowing that whatever happens in life, you'll be able to handle it. Or as S.C. Lourie writes: As long as you have you, you can do anything. It isn't something that comes naturally to most of us. And yet, how well is beating yourself up working for you in being where you want in life? Often, the way we treat ourselves simply makes us feel worse and leaves us stuck, rather than moving us towards our desires. This mini-retreat combines wild-hearted yoga (all-levels), simple ways to start applying self-compassion + a dose of body love and self-care routines + homemade chai and healthy snacks. By the end of this mini-retreat, our hope is that you will have the skills to start treating yourself differently - and that by being there for you, you will be able to do anything in life. Join Hiba (Psychologist + Coach) and Marisa (Yoga Teacher + Wellness Coach at Wild.Happy.Heart) for a magical time just for you.